Hello, Sorting some George V Straits Settlements stamps recently reminded me of what is called the Key Type differences. From Stanley Gibbons guide I repeat this for your interest. Perhaps a difference worth knowing about so you can check when you are studying your various British Commonwealth George V stamps. As you will see from the image below there are three basic ways to differentiate Die I and Die II. To me the easiest way is to check the angle of the line - the second thick line – below the name of the country. Unless a postal cancel is in the way of course, you should be able to see the difference very easily with a good magnifying glass. The following is copied courtesy of SG. 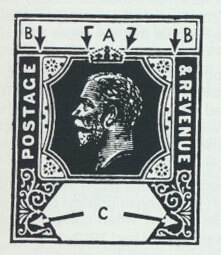 B – in Die I the labels of solid colour bearing the words “Postage” and “& Revenue” are square at the inner top corners, whereas in Die II the labels curve inwards at the top. C – in Die I there is a projecting “bud” on the outer spiral of the ornament in each of the lower letters, whereas in Die II there is no “bud”. In the Straits Settlement issues, by example, two stamp may appear to be the same but they are Die I and Die II and the catalogue value can be very different. For example SG 231 ( Die I) issued in 1923 is catalogued at £13 Used, while the Die II issue from 1926 is calalogued at 30p. Worth checking the Die I think. just once please, and have a look to see if we have what you are missing.